Florida Survival Gardening: Saturday and Sunday Posts? Let Me Know! Plus, Seminole Pumpkins Celebrated! Saturday and Sunday Posts? Let Me Know! Plus, Seminole Pumpkins Celebrated! I've had a few people tell me they go through withdrawal on the weekends when I don't post anything. Would you like posts on Saturday and Sunday? I've posted on every weekday for almost three years... it wouldn't be a big deal to throw in two more posts a week. I love what I do and I love working on this blog... if you all want more, I can give you more. Please send me your photos and any notes you have on where you got your seeds, how large they are and anything dealing with their vigor, etc. 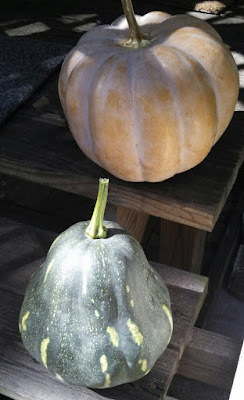 I am creating the only online photo gallery of Seminole Pumpkin varieties for the sake of researchers and gardeners interested in growing this uniquely Floridian breed. Take out the spaces, add an "@" and send me some pics! And... don't forget... let me know if you want me to expand this blog to 7 days a week. Posts 7 days a week?! Oh happy day! Aw David. Take some time off. Everyone deserves a little break. I would love to read more posts but I don't make it to your site every day either and sometimes have to catch up on several days in one sitting. I appreciate all the information you have posted to help others and to share your knowledge. Love both of your books too! I'm on my way to starting a little food forest in the front yard of my house in a Orlando suburb neighborhood... inspired by you, Ruth Stout and the film, "Back the Eden." Thank you. Hey - if that food forest takes off, send pics! I would love to read your blog every day! Love the posts, but it gives me something to look forward to on Monday. Keep your weekend! Family and free time first. Always. Do only what you have time for without sacrifice those two. Having said that, I'll read anything you put up, whenever you put it up. Also, I'm not a very religious person but I certainly wouldn't be opposed to some sort of scriptural-type post on Sundays. Thank you, Scott. My faith is definitely more intellectual than emotional; since I believe the Bible reveals human nature, tyranny, redemption and evil much better than any other text, I hold to it and accept it as coming from God. Wherever you are in your own journey, I do certainly appreciate the kind words.